Beautiful Modern Apartment Homes. Vacation Vibe. Real World Convenience. Discover your lush retreat in the middle of it all. 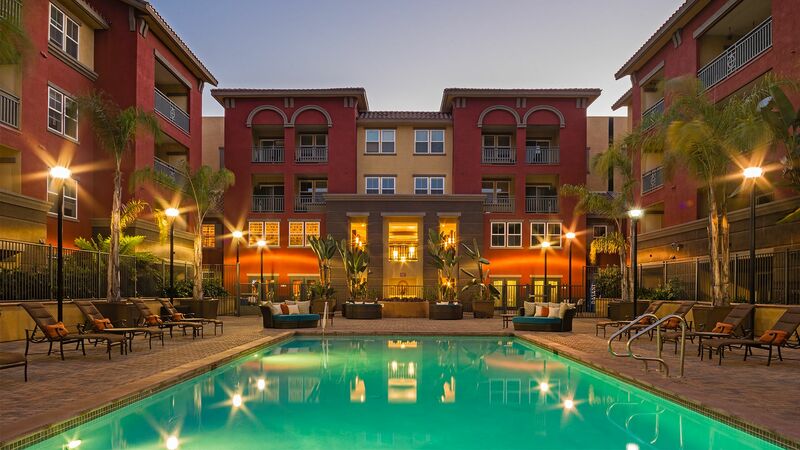 At Mira Bella, you'll enjoy state-of-the-art features and amenities wrapped in style and set in the heart of San Diego living. Cost too much for what you get. When I first moved here i would. Now I wouldn't. The apartments smell like dog pee on one side now. I go to the Jacuzzi and tables are thrown in it. Rowdy teens running all around and playing on the exercise equipment. The office doesn't host events anymore. Our neighbors are so loud. ItÃ¢ÂÂs beautiful and peaceful. I love it! I would recommend this complex but IÃ¢ÂÂd be cautious to recommend it to Junior Sailors due to the cost and the amount it is raised at the end of one year. It's safe and clean. But it's not a community. There's little opportunity to meet neighbors. And I'm not sure which neighborhood I belong to. I haven't dealt much with the office staff, but when I have the particular person was not very friendly, in fact she was a bit rude. Also, since you have installed the wireless wifi I cannot get cell reception from my apartment. It's very frustrating to have to go outside to make a phone call. Also, when I moved into this apartment there were breed restrictions, but I have seen many dogs on that breed list. And lastly, smoking, this is supposed to be a smoke free environment.... NOT! I'm done, my lease expires I will be moving out! The monthly rent does not match the expectations. Cost is the only limitation. clean, upscale feel in a uniquely distinct building. Residents are upbeat and share pride in our community. Quiet, peaceful feel as you walk the halls. Thank you for the great review - and we couldn't agree more! We appreciate your time spent with us and greatly value your input. Please never hesitate in letting us know how we can help, or improve on your experience. I would not recommend these apartments to family or friends. I have lived here for two going on three years now. The cleanliness of the apartments have gone completely down. The trash bins are always over flowing with trash by the elevators. The elevators are never clean unless you're using the ones by the rent office. The grounds smell like dog urine and have poop all over because no one picks up their dog poop. Also, the rent has gone up. I pay more for the same stuff that was here when I moved in. The staff is amazing and the amenities are great.